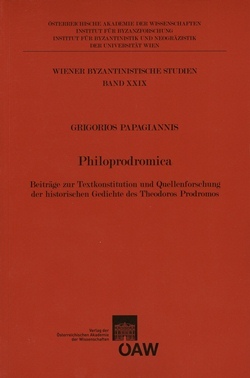 I. Textkonstitution: Die Forschung verfügt über mehrere mittelalterliche Handschriften und Editionen, sogar über eine moderne kritische Gesamtausgabe der Historischen Gedichte des Theodoros Prodromos. Allerdings gibt es immer noch Stellen in diesen Texten, die zu hinterfragen sind (z. T. schon erkannt, z. T. ungefragt akzeptiert). Manche davon werden auch nach der vorliegenden Behandlung – vorläufig? – korrupt bleiben, andere ließen sich deutlich verbessern bzw. besser verstehen, viele wurden geheilt. Letzteres erfolgte auf zwei Wege: Entweder führte die systematische Anwendung von philologischen Methoden und Mitteln (Nachkollation, Grammatik, Syntax, Metrik, Stilkenntnis, vergleichendes Lesen, lexikographische Forschung usw.) auf einen überzeugenden Korrekturvorschlag (emendatio) hin oder, umgekehrt, eine glückliche Eingebung (divinatio) ließ sich (nachträglich) durch die erwähnten Mitteln bestätigen bzw. untermauern. II. Quellenforschung bedeutet in diesem Fall die Suche nach dem Gedankenweg des Dichters, den Versuch alle seinen Andeutungen aufzufangen. Dies geschieht auf zwei Wege: Entweder spricht der Text direkt die „Lesungen“ des Lesers an oder dieser erkennt nur unbestimmt eine gewisse Nachahmung-Reminiszenz usw., die sich dann oft mit Hilfe der Technologie oder traditioneller Methoden genauer bestimmen lässt. I. Textkonstitution: The Historical Poems of Th. Pr. have been preserved in several medieval manuscripts and have been edited more than once; today there is also one modern critical edition of the whole corpus. And yet there still exist problems with the constitution of the text at several points. Some of them still remain after the present work; for others the situation looks much better, and many have been resolved. Restoration of the text was achieved in two ways. By systematical application of philological tools of all kinds (de novo consultation of the manuscript, grammar, syntax, metric, acquaintance with the author’s style of writing, comparative reading of texts, lexicographical research etc.) a convincing emendation was produced. Conversely, an inspiration, like a bolt of lightning in the night, was subsequently confirmed or augmented by the use of the above methods. 2. Quellenforschung here means the tracing of the path the poet’s spirit has followed, the effort to capture all his allusions or insinuations. This is achieved in two ways. The reader may encounter a passage that corresponds exactly with some other text he/she has read before. Alternatively, he/she may only have a vague recollection of a similar text which may be confirmed or precisely located with the help of modern technology or traditional methods.